Mame Balla Diop of AS Pikine is arguably one of the most exciting prospects in the Senegalese Ligue 1. Diop, a lanky central defender, is from the city of Rufisque, basically a suburb to the capital of Dakar. My first record of Diop is from March 2010, when he was named in the squad of the Senegal U-20 national football team. At the time, Diop apparently played for a club called “Centre Angelo Rufisque”, which is a completely unknown club to me. On 17.04.2010, Diop played for the Senegal U-20 national football team against Tunisia U-20. The match ended 0-0 and Diop partnered Djiby Ndiaye of the Diambars Academy in central defence, apparently with great success. 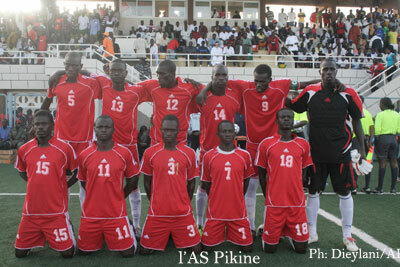 The match was a qualifier for the 2011 Orange African Youth Championship. In October 2010, Diop was once again included in the squad of the Senegal U-20 national football team, preparing for qualifiers against Egypt. Diop also played some friendly matches for Senegal U-20 in December 2010. Sometime between October 2010 and December 2010, Diop joined AS Pikine, a rather modest club in the Senegalese Ligue 1. AS Pikine is based in the city of Pikine, only a stone’s throw from Rufisque. AS Pikine is currently number four in the Ligue 1 2010-2011, rather sensationally. Diop has become an important member of the team and has been almost ever present in the heart of the defence. AS Pikine is a team without big stars but striker and top scorer El Hadji Adama Mbaye (born 18.12.1984) is perhaps the most famous player of the team. In May 2011, after just over ten matches at top level of Senegalese football, Diop was included in the squad of the Senegal U-23 national football team. A few weeks ago, Senegal U-23 played a friendly match against Algeria U-23, and Diop scored one of the goals in the 2-1 victory. The Senegal U-23 national football team is preparing for an important qualifier against Tunisia U-23 in the 2012 CAF Pre-Olympic Tournament. The date of birth of Diop is unknown but his former teammates at the Senegal U-20 national football team are mostly born in 1991 or 1992. The picture of AS Pikine is taken from sudonline.sn. I am not 100 percent sure but I think Diop is the tall player sitting to the right (number 18).